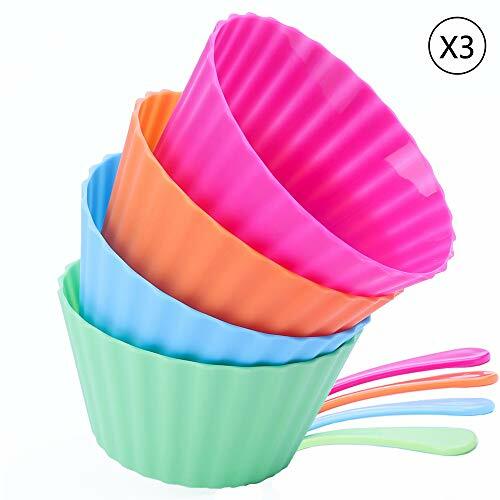 Ice cream bowls set has designed by super quality, reusable, durable, BPA free ice cream cups with adorable matching spoons. Ice Cream Bowls With Spoons are perfect, durable, fine quality, plastic, reusable. Dessert bowls great to be used for party and every occasion. Excellant for ice cream,sundae, frozen yogurt, fruit salad and any kind of desserts. kids will love them. Set of 12 ice cream bowls and matching 12 spoons. It comes in 4 vibrant colors , light green, orange, pink, and blue.Colorful, kids like it more. Ice cream bowls set are 4.2 inches in diameter and about 2.2" tall. It fits a large scoop of ice cream. Are you planning on family party? Your guest will be surprised by this cute bowls and love them. Try it once, you will not regret it . If you have any questions about this product by Colorshow, contact us by completing and submitting the form below. If you are looking for a specif part number, please include it with your message.